On September 30, 2010, the New Writing Series will host a special evening event featuring both the winner of the first annual Millay Prize for Poetry, Rachel Perry, and the renowned poet who graciously served as contest judge, Ann Lauterbach. The event will be held at 7:30pm in the Soderberg Center Auditorium on the University of Maine’s flagship campus in Orono and is free and open to the public (though seating is limited). After brief opening remarks by Steve Evans, coordinator of the New Writing Series and representative of the National Poetry Foundation, Rachel Perry will read from her winning manuscript “After Centralia.” Poet, essayist, and Ruth and David E. Schwab Professor of Languages and Literature at Bard College Ann Lauterbach will then read from her own recent work. The evening’s program will also include several poems by Edna St. Vincent Millay, in whose honor the Prize was established by Frank T. and Helene Crohn, who will be in attendance. To learn more about Rachel Perry and her winning manuscript, click over to the profile of her available here. 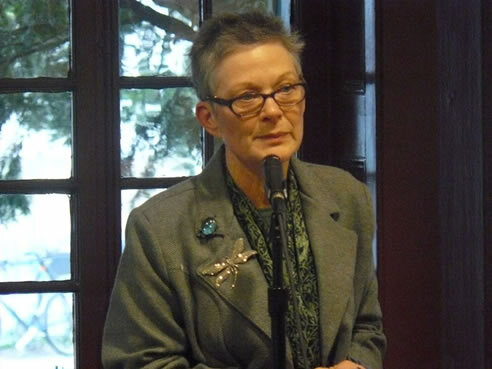 To learn more about Ann Lauterbach, visit her author pages at Poets.org, Poetry Foundation, and Electronic Poetry Center. Sound files of her reading are available at PennSound. You can also read her interview with Tim Peterson, check out her poem “Tangled Reliquary,” and read her essay “Slaves of Fashion.” The Ohio State University Department of Art’s feature on Lauterbach is here. In the spring of 2010, Rachel Perry was selected to receive the National Poetry Foundation‘s first annual Millay Prize for Poetry by the poet Ann Lauterbach. On Thursday, September 30, 2010, at 7:30pm in the Soderberg Center Auditorium on the University of Maine’s flagship campus in Orono, the two poets will read together in a special event of the New Writing Series celebrating the Prize and recognizing the generosity of Frank T. and Helene Crohn, through whose generosity it has been established. The event is free and open to the public (though seating will be limited). Rachel Perry grew up in Pittsgrove, New Jersey, and moved to Maine from Philadelphia in 2008 with her husband, Rob. She received a B.A. in English from Eastern University in Pennsylvania in 2002, and an M.A. in English with a concentration in Creative Writing from the University of Maine in May 2010. At Eastern University, she worked as a writing tutor in the campus writing center and a teaching and writing assistant for EQUIP, a summer program designed to give entering first-year college students an academic foundation for their college studies. After she graduated from Eastern, and before she began her graduate studies, Rachel worked for two years as a journalist for PLAY Philly, an arts and entertainment magazine, and The Suburban and Wayne Times, a weekly community newspaper in the Philadelphia area. She also published her writing in many local publications, including Ticket, Main Line Life, and The Daily Local News. 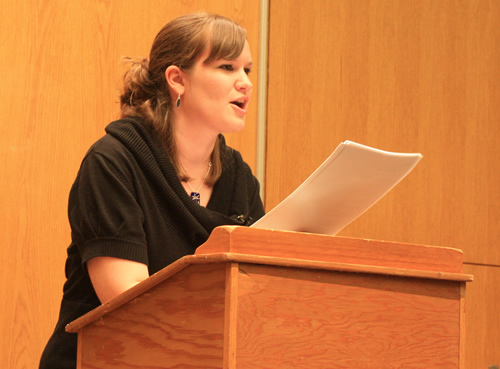 At the University of Maine, Rachel studied creative writing under the mentorship and professorship of Jennifer Moxley, and successfully defended her thesis, a manuscript of poetry entitled Spluttered Birds, in April 2010. During her graduate studies, Rachel also taught first-year college composition for two years and was the poetry editor in 2009 for The Stolen Island Review, the literary magazine produced by English graduate students at the university. In her free time, she enjoys spending time with her husband and her family, reading, exploring the Maine wilderness (by foot, bike and kayak), looking for literary gems in dusty used bookstores, painting and sketching, and, of course, writing poetry. Rachel’s love for poetry began as a child when her parents would read to her and recite poems with her on long car trips. She started writing her own poetry in elementary school and hasn’t stopped since. Her writing has been inspired, over the years, by the poetry of Wendell Berry, Margaret Atwood, Jack Spicer, Peter Campion and John Ashbery, by the places she has lived and visited, and by the visual artists who have the ability to take the poetry of the everyday and transfer it to a canvas, making it something visible and tangible. She is particularly interested in the way artists influence each other and the way different art forms intersect and collide to depict the human condition. For her, the enchantment of poetry is its ability to transform the universal human experience into something both familiar and mysterious, to seek and find something intriguing in the ordinary. Rachel Perry is thrilled and honored to be the first recipient of the Millay Prize for poetry, and she has long been an admirer of the poet for whom the prize was named. She plans to use the award to continue to work on her writing and hopefully publish a chapbook of poetry sometime in the near future. She would like to thank Frank and Helene Crohn for their generosity and their dedication to preserving poetry. The fall 2010 season of the UMaine New Writing Series gets started this Thursday, September 23, with a reading by poets Joanna Fuhrman and Rick Snyder, both making their first appearances in the Series. The reading takes place at 4:30pm in the Soderberg Center Auditorium on the University of Maine’s flagship campus in Orono and is free and open to the public (though seating is limited). Rick Snyder’s debut book of poems, Escape from Combray, appeared from Ugly Duckling Press in 2009. John Yau reviewed the volume favorably for the November 2009 issue of The Brooklyn Rail. Snyder’s poem “How Are You Doing” was picked by Ted Kooser for inclusion in the “American Life in Poetry” series of syndicated newspaper columns. In the October 2006 issue of Jacket, Snyder provided “A Brief Overview of Flarf” that may interest NWS audience members who plan to attend Sharon Mesmer’s reading on November 4, 2010. Joanna Fuhrman’s newest book is Pageant, published in 2009 by Maine-based Alice James Books. Her three previous collections, all from Hanging Loose, are Freud in Brooklyn (2000), Ugh Ugh Ocean (2003), and Moraine (2006). Thomas Fink’s appreciation of Ugh Ugh Ocean can be read here. Lauren Russell wrote up a “reading report” about Fuhrman’s February 2010 reading at The Poetry Project in New York City, where Fuhrman coordinates the Wednesday night reading series. To hear her read, check out her PennSound page. If you’re on Facebook, consider joining the New Writing Series group here. The University of Maine English Department and the National Poetry Foundation are pleased to announce the Fall 2010 schedule for the New Writing Series. Check this blog for individual event information. If you’re on Facebook, consider joining the New Writing Series group here.